In a skillet, cook the four slices of bacon. Remove from skillet and transfer to a paper towel-lined plate to drain the fat and cool. While the bacon is cooking, begin cutting out your jack-o-lantern faces into the flour tortillas. 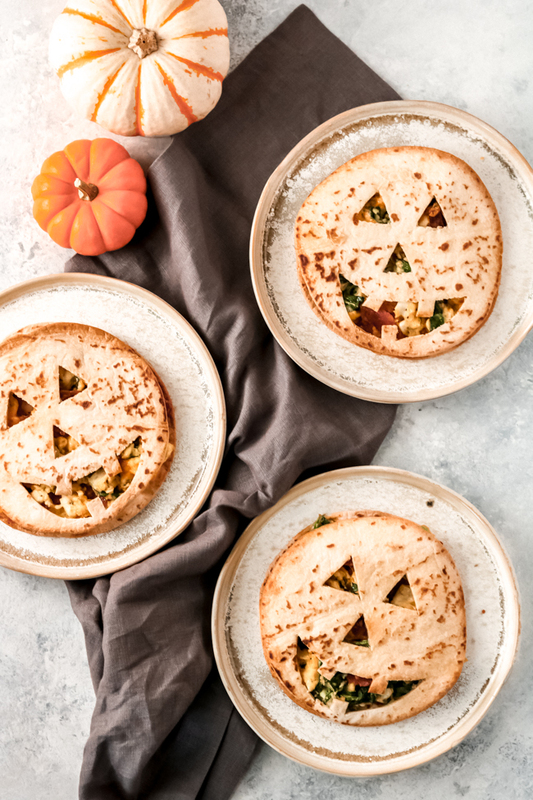 Using a knife, cut a Jack-o-Lantern face into four of the flour tortillas. Set aside. In a separate skillet, melt the butter. Add the eggs, spinach, salt, and pepper to the skillet. Using a wooden spoon or spatula, scramble the ingredients together. 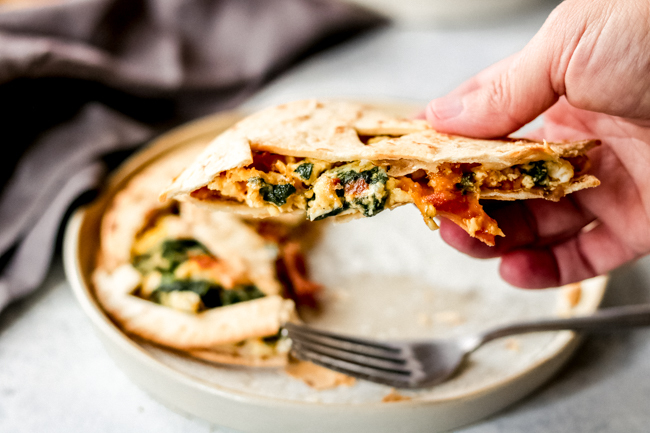 Continue to scramble until the eggs are thoroughly cooked, and the spinach is cooked down. Add the shredded cheddar cheese to the scrambled spinach and eggs, stir to combine. Next, crumble the bacon onto the scrambled eggs and stir to combine. Place four whole flour tortillas onto a lined baking sheet. Spoon the scrambled egg mixture onto each of the flour tortillas, spread to cover the entire tortilla, then top with the Jack-o-Lantern tortillas. Brush with olive oil then place into the oven and bake for 10-15 minutes.